I wasn’t entirely convinced that I would get this dress finished in time, but after a lot (and I mean a lot) of unpicking and resewing, I finally have a finished dress! 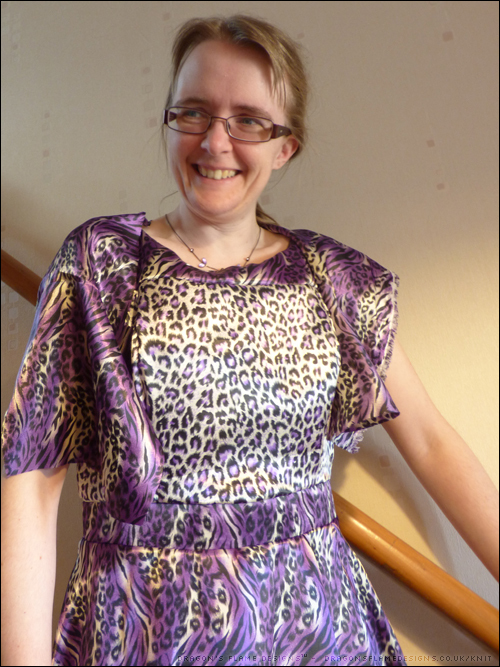 I went with the idea of using two different fabrics to show off the different pieces of the bodice, and chose a combination of two animal print satin fabrics from Minerva Crafts. The fabric was so sleek and had such a great feel, I also made a small shawl to go with it. I quite liked the semi-frayed look of the selvedge edge so I kept that on the shawl edge. 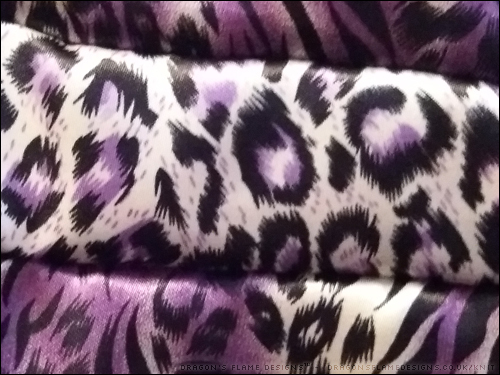 Originally I had aimed for the yoke and waistband to be in the leopard print, with the rest of the bodice in the tiger print, with the opposite on the lining. However, after a few mistakes, I ended up swapping the lining and main pieces, which thankfully went much better. I would use satin fabric again, but only for a top – I don’t think my sewing skills are quite up to the task of tackling another dress in such a temperamental fabric just yet. 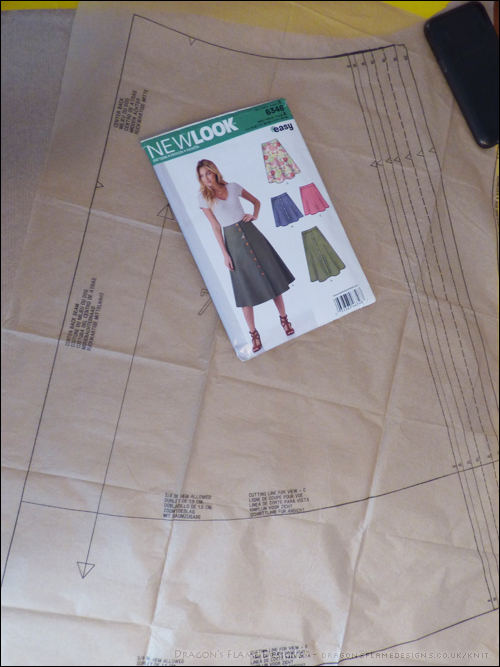 I would try making another dress from this pattern though…. but out of polycotton or cotton instead. 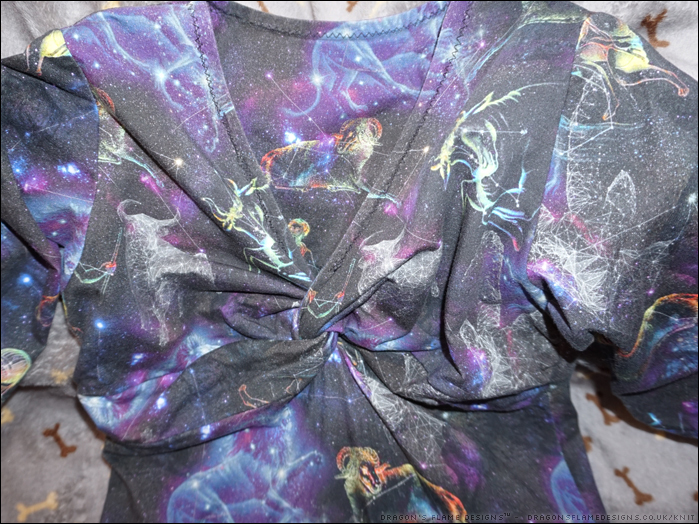 But this has challenged me to make a dress I probably wouldn’t have attempted, out of a fabric I usually would avoid…. and I’ve got a dress out of it, so I’m happy! 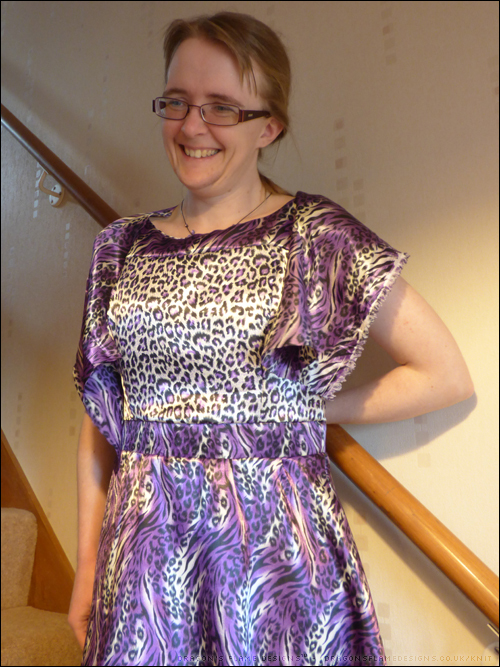 This entry was posted in Clothing, Sewing and tagged clothing, Dress, Dressmaker, satin, Simplicity 6390, Simplicity Sewing Challenge on September 13, 2017 by Sewist. This year I thought I would challenge myself by making a skirt. 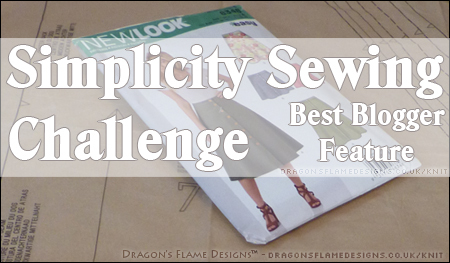 An ideal make for the “best blogger feature” in the Simplicity Sewing Challenge. 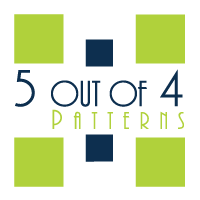 We were able to pick any of the challenge patterns for this category. 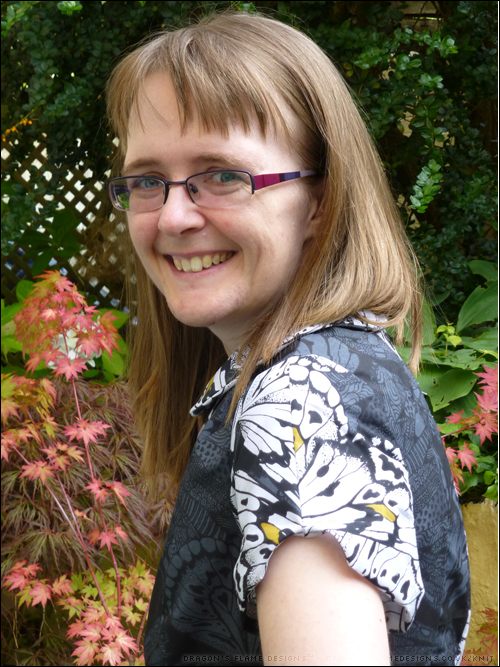 I chose the New Look 6346 skirt pattern – I never seem to have the right style of skirt when we have warm summer weather! I also need more practise at making skirts that actually fit me! Originally I was going to pick version A (the longer button-up skirt), given the cooler summers we often get I thought this would be a good choice! After looking at the options in detail, I went with version C – the shorter zipped version instead. I think that style will be more user-friendly when it comes to wearing it, and should be just the right length for me, especially as I am just five foot tall! 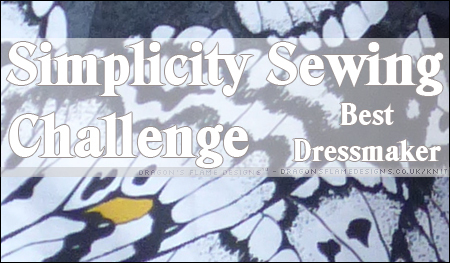 The whole idea of the sewing challenge is to make “your take on a Simplicity make” but how on earth can you make a skirt different enough? 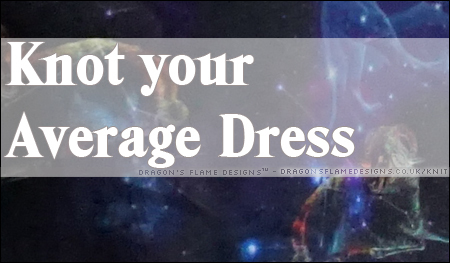 I didn’t think that simply adding pockets or a decorative trim would be radical enough, and I’m not really into “girly” trims anyway, so I thought I’d be totally different and make the skirt into a dress! Armed with my self-drafted bodice pattern, I worked out that I’d need a size 12 for the skirt, but just in case I needed to make a larger size at a later date, I didn’t want to cut into the paper pattern. Then came the next challenge – how to trace off the pattern accurately. I’ve seen freezer paper mentioned on a lot of blogs, but I’ve never seen it on sale over here; greaseproof paper is nicely transparent, but only comes on narrow rolls and no matter how hard I try it will not stick to itself! And believe me I have tried!! Instead I bought a pack of Burda dressmakers’ carbon paper from a local fabric shop plus a roll of brown paper from Poundland on a whim to see if that would work. It definitely works well – the yellow and white show up brilliantly on the brown paper, and it can be stuck together with ordinary sellotape to make a wider sheet if needed. My bodice pattern finishes at the waistline and the New Look 6346 skirt waistband sits just above the waist, so I was able to line them up perfectly. Because of the darts in the bodice, I chose to cut the pieces separately, so I had the bodice and neck / arm facing, waistband and skirt for the front and back. Keeping the waistband in the dress, meant I was able to retain the shape of the New Look 6346 skirt, while still making it into a completely fresh look. 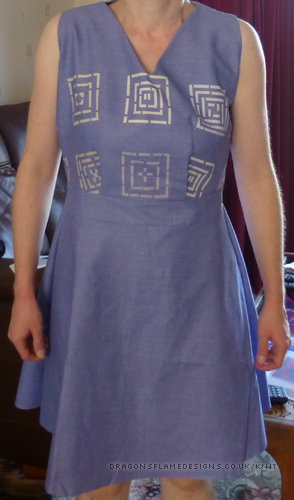 The dress had the potential to turn into a ‘mongrel’ where I was trying to join two different patterns together, so before I cut into my posh fabric, I made up a wearable muslin version first. I find this really helpful to have a “rough” version to experiment with. Who knows it may even turn out wearable! The bodice needed a little fiddling to get the waistline to match the skirt – rather than making the darts larger, I folded over a little more fabric at the base of the darts to make the measurements match without cutting out too much breathing space. Despite the excess fabric at the front, the fit was a lot better than I’d anticipated. 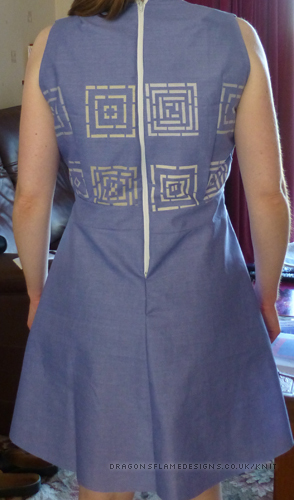 However, in sewing the zip into the back, I managed to get the seams misaligned. Argh! Decision time. Do I want to unpick a lot of tiny stitches and risk making a hole in either the fabric or the zipper tape? 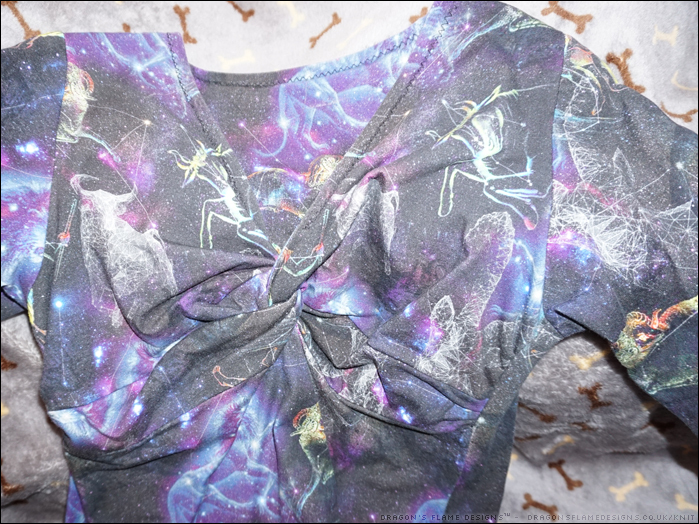 I decided to be reckless and break out my posh fabric to start the final version. I am always anxious when cutting into my posh fabric. Making that first cut is a challenge in itself! This particular polycotton is quite ‘fray-happy’ so I’ve taken care to finish all my raw edges as I go – the faux overlock stitch on my machine is proving really handy for this. I find that using a zigzag stitch with the regular foot makes the fabric catch up a little, leaving a ridge instead of a nice flat edge. The facings were a challenge, as I had drafted one facing to cover both the neck and armhole, but had no idea how to stitch it without any of the stitches showing on the right side! In the end, I stitched the neck as normal, and top stitched the armhole facing into position. It’s not visible unless you really look closely, and it certainly shouldn’t come undone in a hurry! 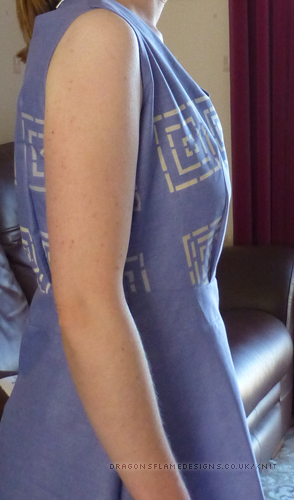 A finished dress from New Look 6346 and a self-drafted bodice pattern. 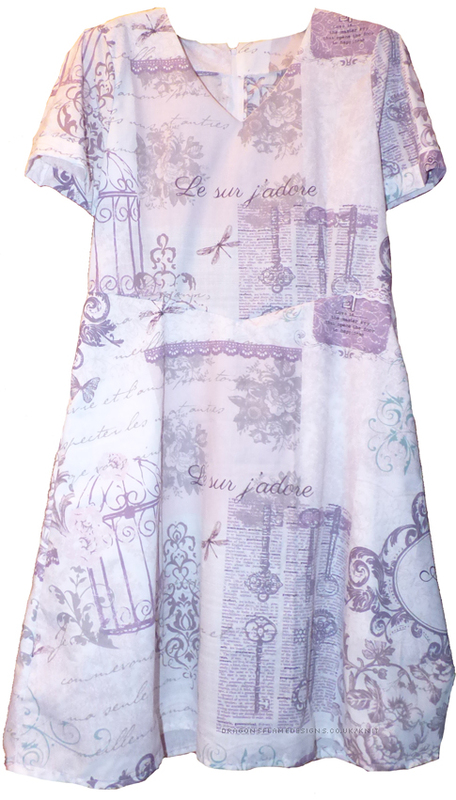 I am really pleased with the way the bodice and the skirt come together in the design of the fabric. 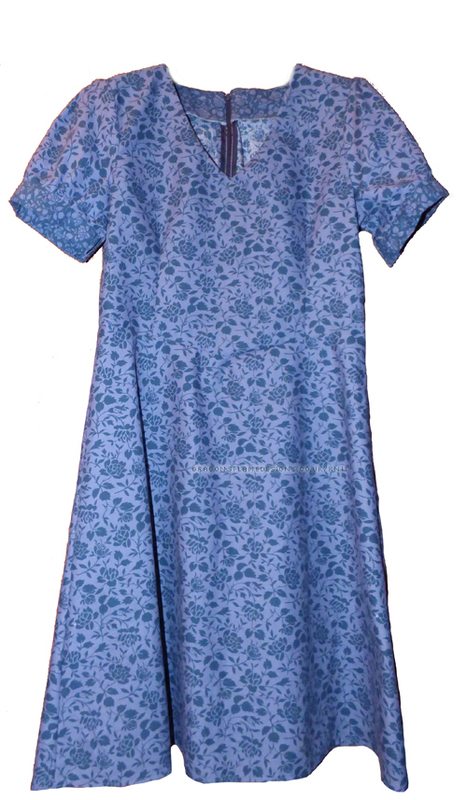 The finished garment fits really well, and I think the fabric works wonderfully – it reminds me of a painting by numbers pattern. 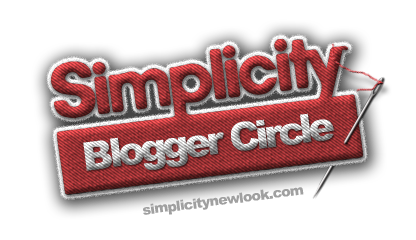 Thanks for the challenge Simplicity – now I have a whole new look!! 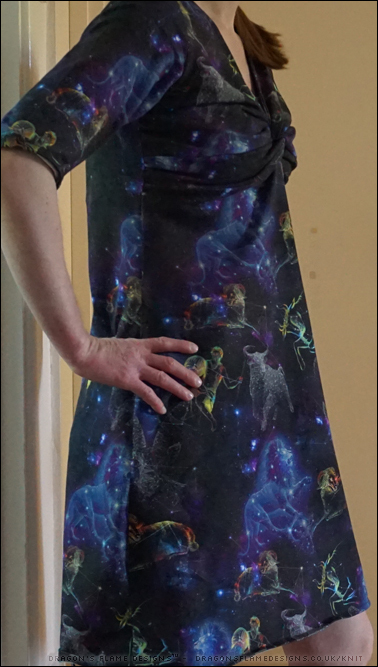 This entry was posted in Clothing, Sewing and tagged #success, Dress, New Look 6346, sewing, Simplicity, Simplicity New Look, Simplicity Sewing Challenge on September 28, 2016 by Sewist. 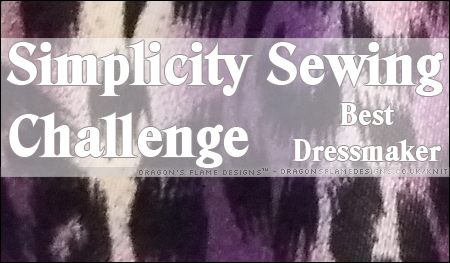 Back in May, I signed up for the Simplicity Sewing Challenge – the two sewing patterns arrived in early July, and once I finished my skirt dress, I set to work on my second pattern – Simplicity 1458 for the “best dressmaker” category. It’s the first time I’ve even looked at princess seams, let alone an “amazing fit” pattern, so this dress was going to be a nice challenge! 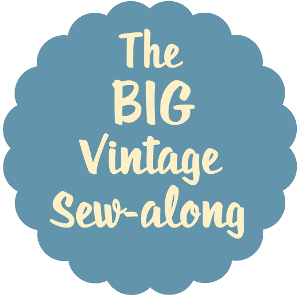 I started off by making a muslin but unfortunately my choice of fabric wasn’t that helpful – I’d picked a cheap polyester duvet cover, but the polyester meant the fabric slipped all over the place. 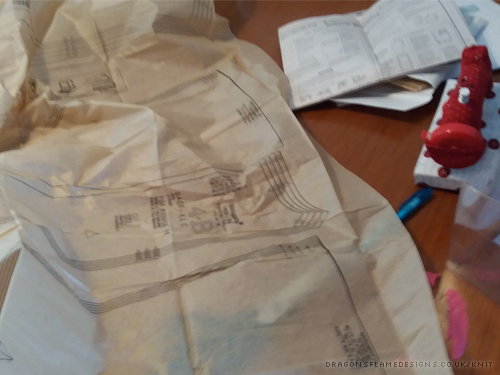 So I scrapped plan A, and moved on to plan B: start again, and trace off the pattern pieces onto my new favourite sewing tool – brown paper! Ok, that probably sounds really weird, but I can’t get cheap freezer paper over here, and tracing paper is stupidly expensive. I have tried using greaseproof paper, but that doesn’t stick together at all, so I can’t make it wide enough for some of these pattern pieces. Using some dressmakers carbon paper, a blunt pencil and the brown paper, means I can trace the pattern off, without risking cutting the original – really useful when you aren’t 100% certain of the size you’ll need, and don’t want to cut into the original. I wanted the middle panel on the front and back of the dress to have a contrasting pattern to the sides and what better way to achieve that, than using a duvet cover? A double cover gave me plenty of fabric to play with, and I should have enough left over for a second dress too! 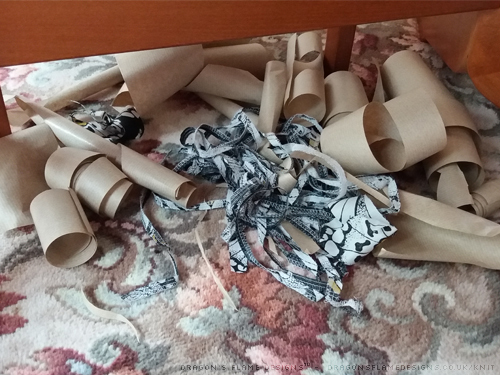 The only trouble is, cutting out all the brown paper pattern pieces and trimming the seams to separate the duvet cover pieces does tend to mean there’s a large pile of rubbish lurking under the table…. but that aside, I can finally get sewing these pieces together. Generally speaking, I do not get on with sewing curves, particularly with opposing curves, as the concept of “easing” in fabric just sounds like a foreign language to me. But I wanted to make the seams as neat as I possibly could, so I made sure to machine tack all the seams and try the dress on several times before doing the final seam stitches. The instructions are really informative, with instructions on how to let out or bring in the seams to suit your overall fit. Surprisingly, there wasn’t much I needed to do to get the fit just right for me – I just had to let out the side seams and also adjust a couple of the curved princess seams. I did my usual trick of using a regular zip rather than a concealed one, so I stitched the base of the centre back seam, and put the zip in before doing anything else. It’s so much easier to put in flat! I decided I wanted to add in the sleeves from view A, even though I would normally avoid them like the plague, but cheated slightly and stitched them in flat before I stitched the side seams. 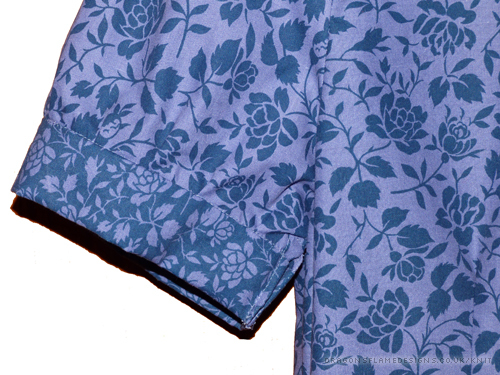 That meant the sleeves were easier to put in, and there was a lot less chance of the seams puckering. I’m pretty sure my V notch in the sleeve is wider than on the pattern, but I think it makes a nicer shape. 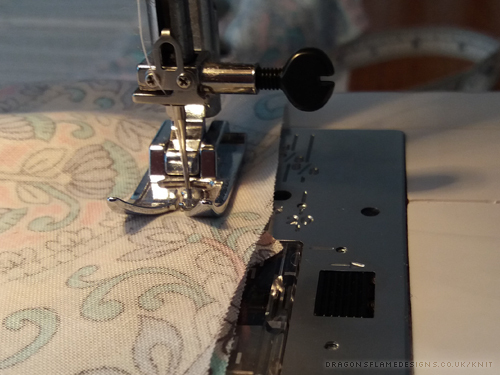 I was very good and followed the pattern for the hem, stitching it by hand rather than cheating and using the machine. Not content with adding sleeves from view A, I also decided to add in the collar from view C. This had to be unpicked a couple of times, as I’d managed to sew it in slightly wonky, but overall it gives the neckline a really good look. 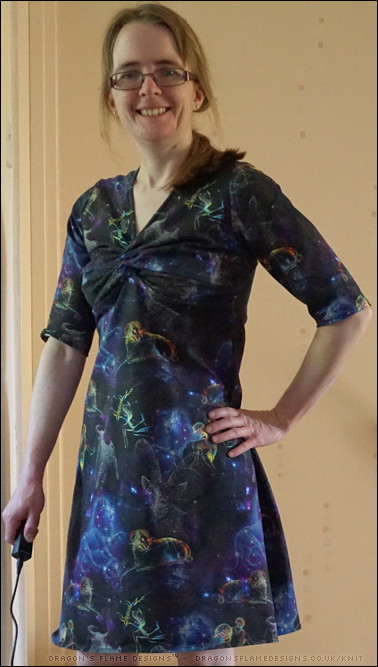 So there you have it – a finished Amazing Fit dress, that actually does have an amazing fit! 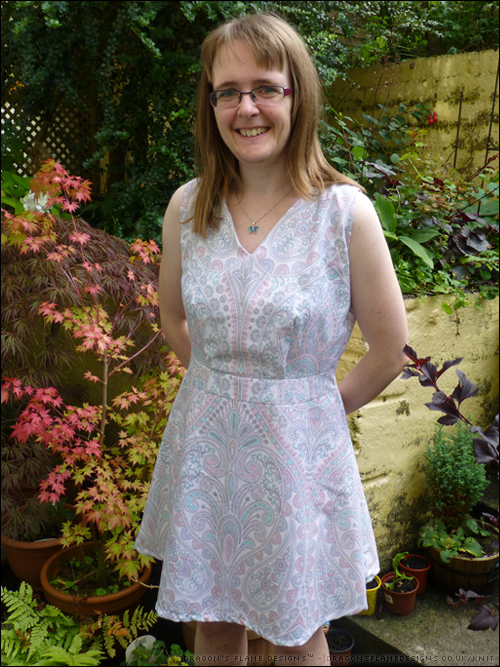 This entry was posted in Clothing, Sewing and tagged #success, Dress, duvet cover, Simplicity, Simplicity 1458, Simplicity Bloggers Challenge on September 6, 2016 by Sewist. 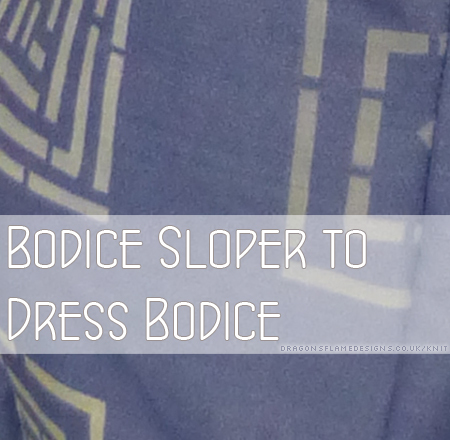 This is my first attempt at using my bodice sloper to make a dress bodice, and it hasn’t come out too badly! At the moment, the zip is tacked into place; there’s a bit of a catch at the base of the zip that I need to work on, but once that’s done, I can stitch the zip in place properly. 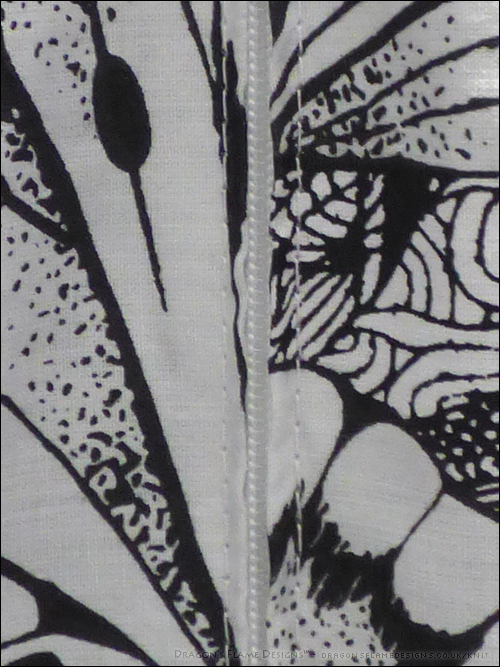 Those finishing stitches on the zip should also give a slight overlap of fabric, so the zip itself isn’t visible. One day I’ll invest in a concealed zip foot and learn how to do those, but for now, I’m sticking with a centre zip. On to the not-quite-so-good parts…. I have no idea what happened with the darts – they’re not the same length, and are finishing way too high! The armholes are perfect (which I’m amazed about, considering I don’t have a French Curve ruler and ended up drawing the curves in freehand)! But you can clearly see there’s some excess fabric at the front of the bodice, and also a bit of a gap at the back on the neckline. I think maybe the back gaping wasn’t helped by changing the neckline on the front. I have a feeling that altered the shoulder width, so my darts in the back shoulders are a bit too wide. Hopefully the back gaping can be helped with a hook and eye at the top of the zip, but the front might need another dart coming from the armhole. This entry was posted in Clothing, Sewing and tagged Dress, Self Drafted Bodice, sewing on August 9, 2016 by Sewist. 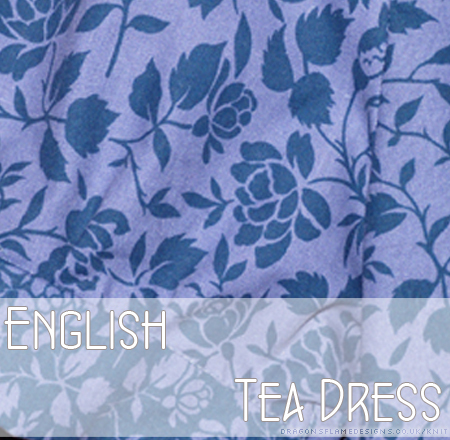 Following on from my success with the English Tea Dress, and realising that the style actually seems to suit me a lot better than the “fit -and-flare” style dresses I’ve tried before, I thought it was time I dug out Summery duvet cover, to make a second dress from. 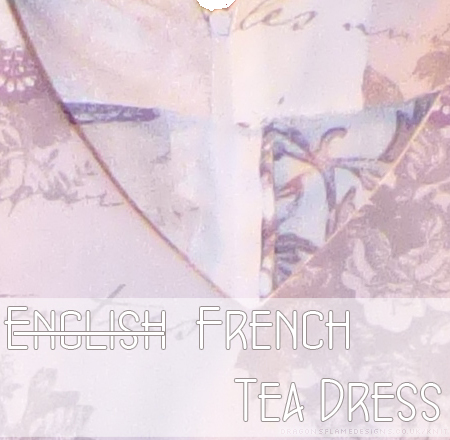 Of course this fabric doesn’t really fit the English Tea Dress name, so I’ve renamed this one the French Tea Dress. The duvet cover also came from Primark, and was slightly more see-through than the previous one, so I had to make a lining for the skirt. I cheated though, and just cut another piece of each skirt part, then held them together as I stitched the seams, treating the two pieces of fabric as one. I’m positive that not the “correct” way to include a lining, but it worked for me! Unfortunately, I didn’t have quite the right length of zip, so it’s a little snug to get on and off…. but it still fits, even though there’s a couple of areas on the sides which aren’t perfectly aligned (blame that on adding in the second piece of fabric for the lining – my seams didn’t catch all found layers on the sides, so there’s a few wiggly lines here and there). The zip itself is a load neater than the first one – I think I’m gradually getting the hang of this now! All I need to do next is find some shoes to wear with it – trainers just wouldn’t look right. 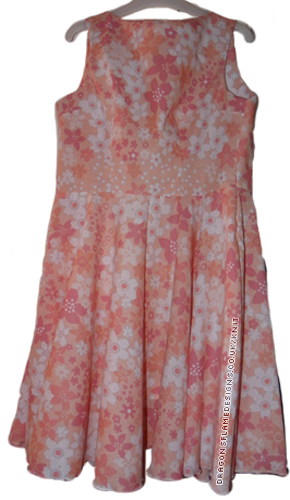 This entry was posted in Clothing, Sewing and tagged Dress, sewing on August 8, 2015 by Sewist. 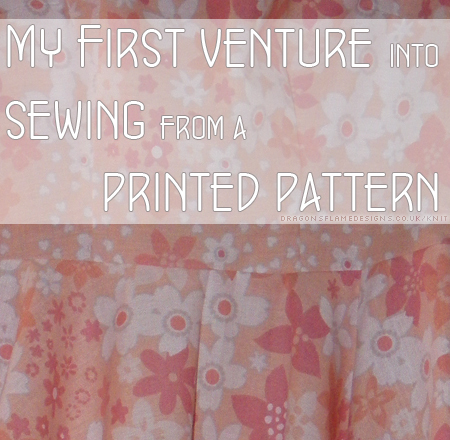 My previous experience with Simple Sews patterns wasn’t all that fantastic. Using the measurements provided, the dress should have at least fitted, but the back wouldn’t meet, let alone meet enough for a zip to go in. 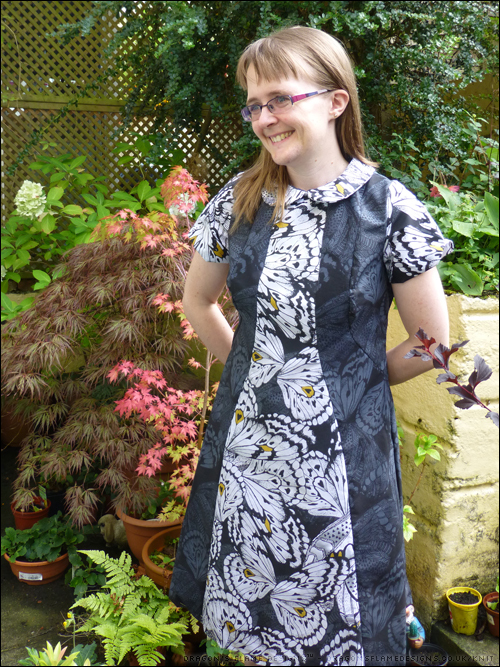 But the style of the English Tea Dress made me want to have another go, in the hope that I could figure out the fit a little better. The neckline is more suited to my taste, with a nice v-neck that has just the right amount of plunge. The back is a round-neck, so no worries about picking a suitable bra to wear so the straps don’t show! I did give an allowance of an extra inch on each of the back seams but I hardly used any of that, so the sizing definitely seems like it’s more accurate for this one. I will admit I got in a mess with the sleeves though; the pattern didn’t really make complete sense for the cap sleeves, nor for attaching the cuff. So, I used the short gathered sleeve, and added a contrast cuff as if it was bias-binding, rather than following the instructions. The cuff was slightly snug so I left it open on the end, stitching down the seams on either side. 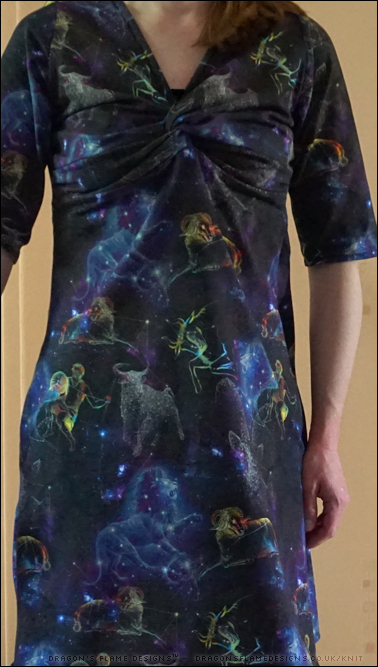 The fabric was actually half of a single duvet cover from Primark (£9), so including the thread and zip (I already had the interfacing from a previous project), the dress cost me £6.40. Now that’s a bargain, especially for my first finished dress! 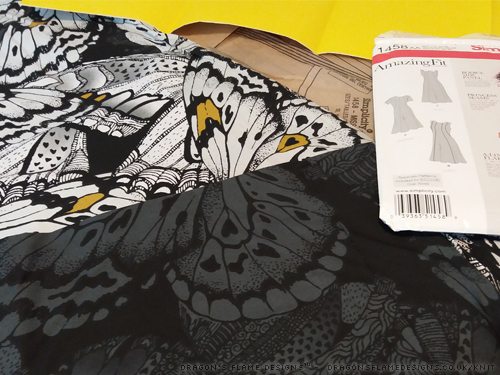 This entry was posted in Clothing, Sewing and tagged Dress, sewing on August 7, 2015 by Sewist.